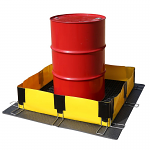 The ENPAC range of Portable Bunds provide a flexible and easily erected portable bund that will assist in the temporary containment of hazardous liquids to prevent either environmental or workplace contamination. Manufactured from tough, yet lightweight, materials they are designed for rapid deployment and provide a cost effective and efficient solution for containing liquids. The smooth profile of the bunds facilitates easy cleaning. They are widely used as a method of containing and safety bunding for mobile plant and generators, as a method of catching fuel and chemical spills or as a temporary measure for liquid storage.